You can watch SNAG’s new “Show us your Hammer” video below. And be sure to check out SNAG’s new campaign on Indiegogo! By supporting and sharing our campaign, you are helping to ensure the future of SNAG. Your investment in SNAG, no matter the size, will allow us to continue advancing artists, supporting students and validating our field. Your gift will make a mark in the life of an artist and support our community of creative problem solvers. SNAG is seeking nominations for its 2015 Lifetime Achievement Award. The recipient will be honored at the Boston conference in May. 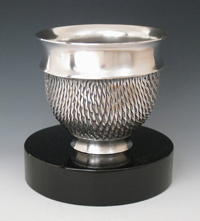 This award is SNAG’s highest honor and is presented to individuals who have made significant contributions to the field of metalsmithing. For the 2015 “Exhibition in Print” Moved by Metal: On Beauty as Interaction, curator Wendy Steiner seeks out metal objects—jewelry, sculpture, tools, gadgets—from any culture, that incite revelatory responses in their viewers. SNAG would like to take this opportunity to recognize our Corporate Members for their support: Facèré Jewelry Art Gallery and Halstead. James Thurman first became aware of metal spinning almost twenty years ago, and has been transfixed by its rapid demonstration of the plasticity of metal. This article is based on small-scale metal spinning pieces that Thurman created for the Pin Swap at the 2010 SNAG Conference in Houston, Texas.